Waking up on a Monday morning and finding the motivation to go to work is a struggle most of us have, but this struggle is made even harder when you know you have to wake up several hours earlier to sit on public transport (or in congested traffic on the motorway) in order to get to work on time. And this long commute could be having an effect on your happiness levels. According to Inc, the average American has a 50 minute round trip commute, but some people have much longer journeys to and from work. In England, the average commute is more, having risen from 48 minutes to 60 minutes in the last 20 years, and the publication notes that one in seven people’s work travel takes more than 2 hours. And now research from the University of the West of England has shown that adding just 20 minutes more to your travel time per day has the same negative effect on job satisfaction as if the individual were to have a 19 percent pay reduction. No one wants to spend time standing shoulder to shoulder with people during rush hour or running to catch the next bus on time. 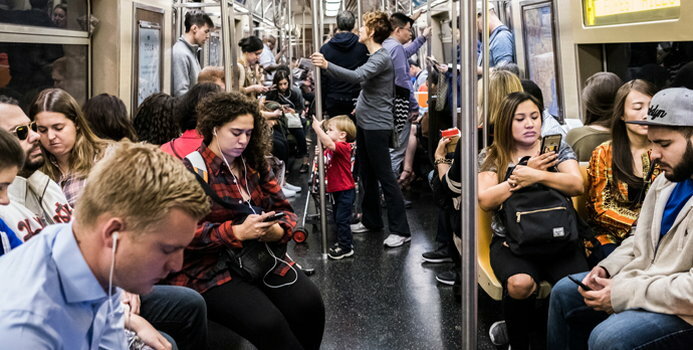 However, if there is a job that offers higher pay, people are more willing to travel further — although these findings show that those who have long commutes are as unhappy as those who make less pay, even if that is not necessarily the case. The NHS also comments on the way commutes are causing stress and affecting people’s mental and physical health, referencing a report from the Royal Society for Public Health (RSPH). The report is focused on individuals who do not walk or cycle to work, but instead are engaged in non-active commuting. The organization notes that the lack of activity can impact blood pressure and mental health, but can also be linked to bad snacking habits, and results in less time to be active.